Ischemic optic neuropathy (ION) can be one of many causes of sudden, persistent vision loss. It is likely that you will not feel any pain at the time. This disorder is caused by a decrease in blood flow to the optic nerve. There are two types of ION: Arteritic and non-arteritic. Arteritic ischemic optic neuropathy (AION) is caused by inflammation in the blood vessels to the optic nerve, which is known as temporal arteritis. Temporal arteritis is an ocular emergency, since the loss of vision in one eye can eventually involve the other one and progress to severe visual loss. By clicking on the link for temporal arteritis, you can learn more about the diagnosis and treatment of AION. Non-arteritic ischemic optic neuropathy (NAION), the most common form of ION, is caused by cardiovascular disease. If you have high blood pressure, high cholesterol and / or diabetes, you are at risk for developing NAION. Your risk is increased if you also smoke. According to the National Eye Institute, NAION is the most common cause of optic nerve damage in the elderly. 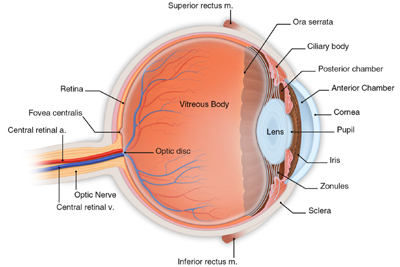 NAION is the disruption in blood flow from the ciliary arteries to the optic nerve, which causes damage to the all or part of the optic nerve. This disruption in blood flow is a small stroke that only impacts vision. Depending on the damaged portions of the optic nerve, the sudden loss of vision can impact your central vision, peripheral vision or both. Because the sudden vision loss often occurs upon waking, the lowering of blood pressure during sleep may be linked to the reduced supply of blood flow to the optic nerve in high-risk people. In approximately 30 percent of patients, the non-arteritic ION is progressive, meaning that their vision will continue to deteriorate. For most of the remaining patients, the loss of vision will remain permanent and stable. Some studies have shown that up to 40 percent of patients with NAION may experience some vision improvement. However, approximately one in three (1/3) patients will eventually experience some loss of vision in the other eye. How Is Ischemic Optic Neuropathy Detected? Your eye doctor will also review your overall medical condition as part of the diagnosis process. Blood tests will be ordered. How Is Ischemic Optic Neuropathy Treated? If you are diagnosed with arteritic AION associated with temporal arteritis, treatment is with immediate steroids. In non-arteritic AION, the main focus of the treatment is to address the underlying factors that have contributed to the visual loss such as hypertension, diabetes, increased cholesterol, clotting disorder and sleep apnea. Controlling your blood pressure, cholesterol and diabetes may reduce the risk of NAION occurring in your other eye.